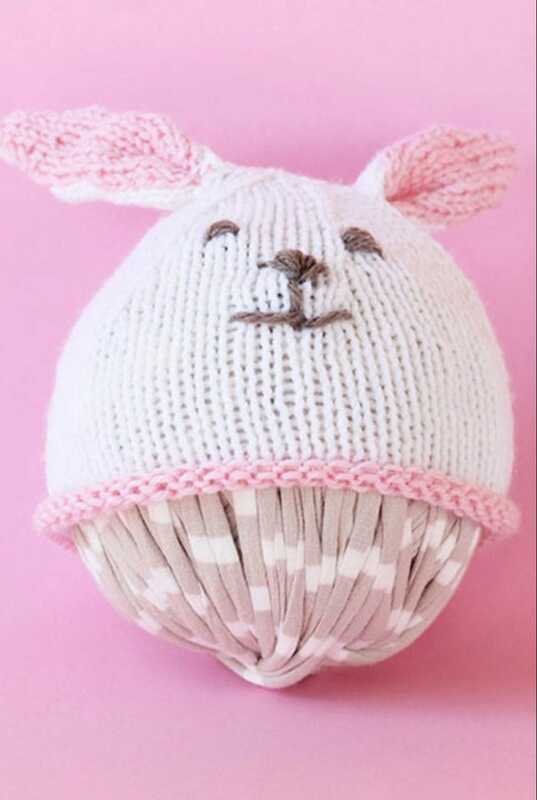 Make a bunny hat this Easter for your little ones to look super cute in with this easy to knit free pattern. These hats are so popular and I have made and sold many in my Etsy shop over the years. You can make the hat in various colours from white, grey and brown to brights or pastels shades – anything goes! 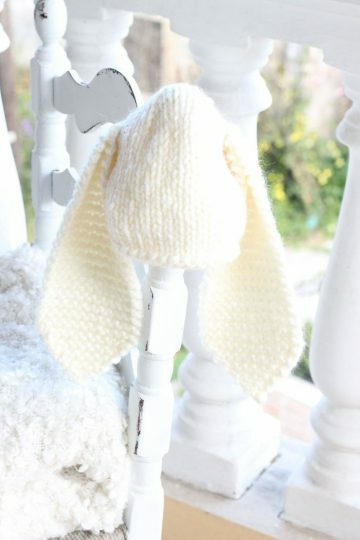 The baby hat is knit in the round, with the ears worked flat, then stitched into place. I find it easier to stitch them on when the hat is placed over a ball of yarn. This allows you to sew them on and see where they are equal. The hat is made in 3 pieces – the beanie, and the two ears, this means that you will have to stitch the ears onto the hat. The ears are knit in garter stitch and are folded in half before being sewn onto the hat. You can also modify the pattern to make the ears longer or shorter. 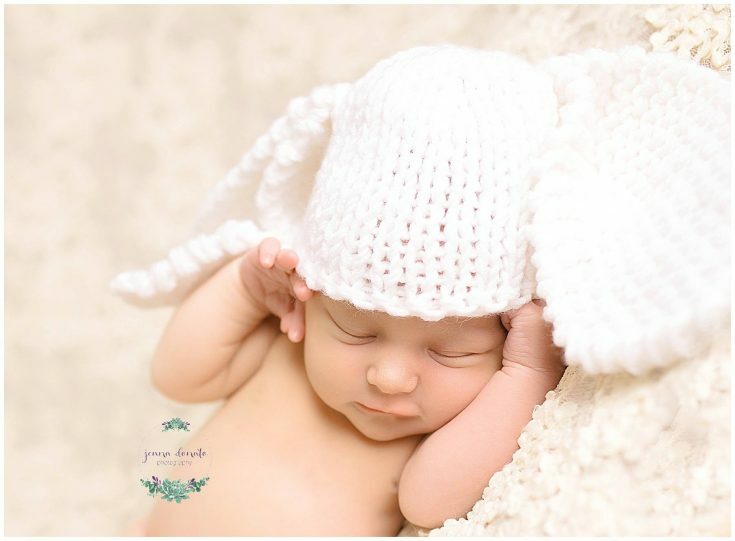 The bunny hats are so cute on little ones and can be great for any parties they have or to wear during the Easter holiday. They are also great for any newborn photography sessions you may have set up in spring. 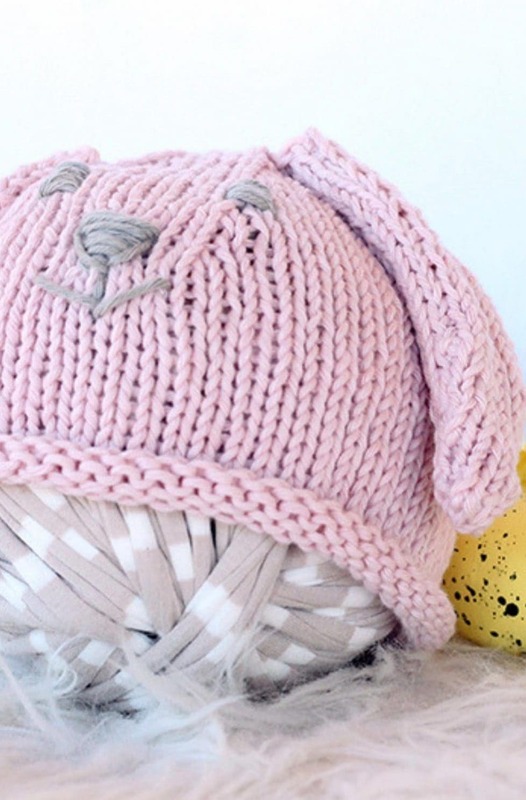 It can be hard to find Easter hats for little ones and this pattern is so easy you can make them for friends and family too! For this pattern, I have used many different brands of super bulky yarn, including Yarn Art Alpine Alpaca and Lion Brand Wool-Ease Thick and Quick. I also like the Lion Brand Hometown yarn and Alize Lanagold Maxi. You can experiment with yarns and textures – a fluffy textured yarn like a boucle would also work really well! 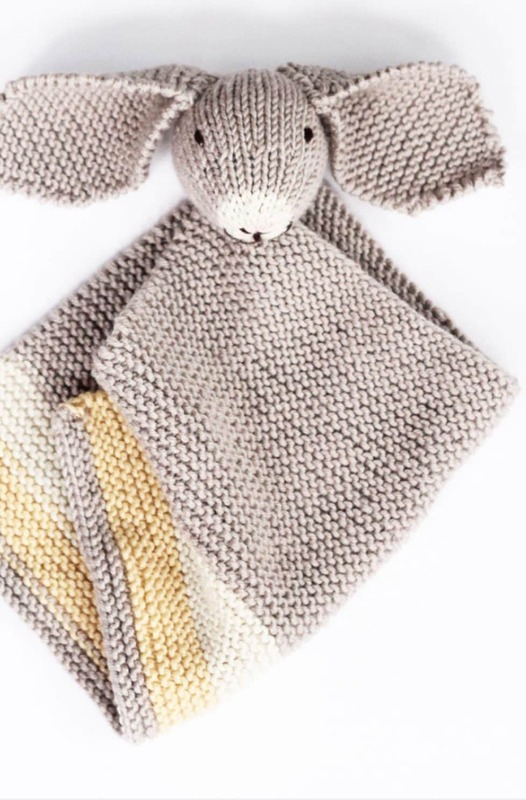 Make a baby bunny beanie with this easy to knit free pattern. The bunny cap is knit in the round, with the ears worked flat, then stitched into place. 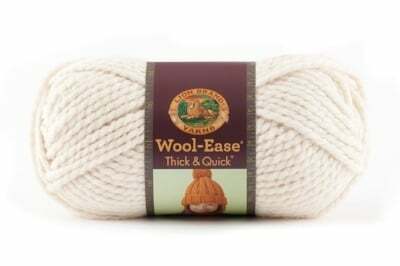 Super Bulky Yarn 06 - suitable for size 9.00mm (US 13) needles. 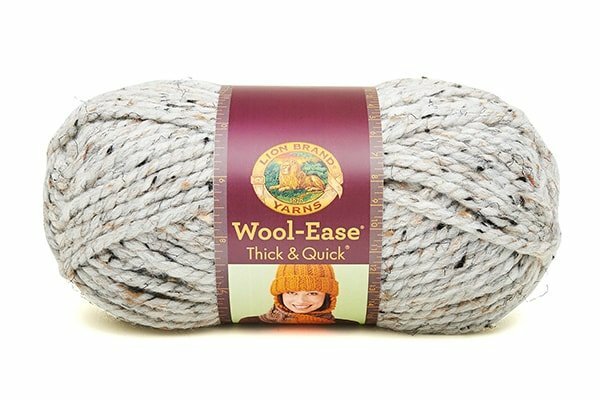 170g - Lion Brand hometown/wool-ease thick and quick or something similar. Cast on > 30 sts (0-3 months) / 32 sts (3-6 months) / 34 sts (6-12 months) / 36 sts (18/24 months). Join in rnd, placing a marker on first st.
Knit every round until the work from beg measures 5.5″/6″/6.5″/7″. Size 0-3 months/3-6 months/6/12 months only: Next rnd: (K6. K2tog. K7. K2tog) twice. Size 18/24 months only: Next rnd: *K4. K2tog. Rep from *around. Both sizes: Shape top: 1st rnd: *K3. K2tog. Rep from * around. 3rd rnd: *K2. K2tog. Rep from * around. 5th rnd: *K1. K2tog. Rep from * around. 6th rnd: *K2tog. Rep from * around. Draw end through rem sts and fasten securely. Using 9mm needles cast on 18 sts, leaving a tail of around 12 inches to stitch the ear to the hat. Knit every row until piece measures 13 inches. K2tog, cut yarn and thread through. Pull yarn tight and stitch in the loose ends. Make a second ear to match. The ears should be folded in half and then stitched onto the hat. Fold the hat in half and stitch the ears to either side. Alternatively, you could also use a small ball or a ball of yarn to place your hat onto, then see where you want to stitch the ears. This bunny hat knits up quickly in super bulky yarn, and the simple design makes for a relaxing and enjoyable knit. The instructions are written for smaller sizes. If changes are necessary for larger size the instructions will be written thus ( ). Please measure to make sure you have the right circumference for your hat as every baby is different and may need to go up or down a size.